The ability of several chelating mycotoxins to form coordination complexes with the lanthanide metals europium and terbium was explored. 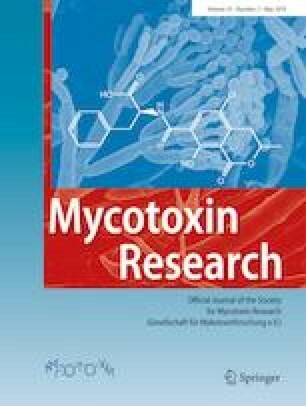 The mycotoxins examined included ochratoxin A, citrinin, cyclopiazonic acid (CPA), kojic acid, and tenuazonic acid (TeA). Of these compounds, TeA and CPA resulted in the greatest luminescence. 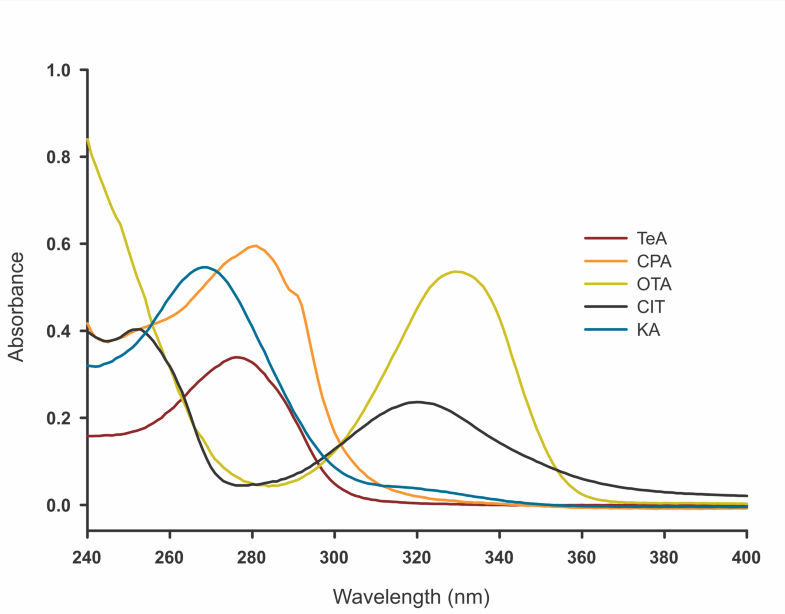 Parameters influencing luminescence of TeA were investigated further. These included the type of lanthanide and its concentration, certain environmental factors, and the effect of competing metal cations. Of the two lanthanide metals, the terbium coordination complex (TeA-Tb3+) showed greater luminescence relative to the europium complex (TeA-Eu3+). 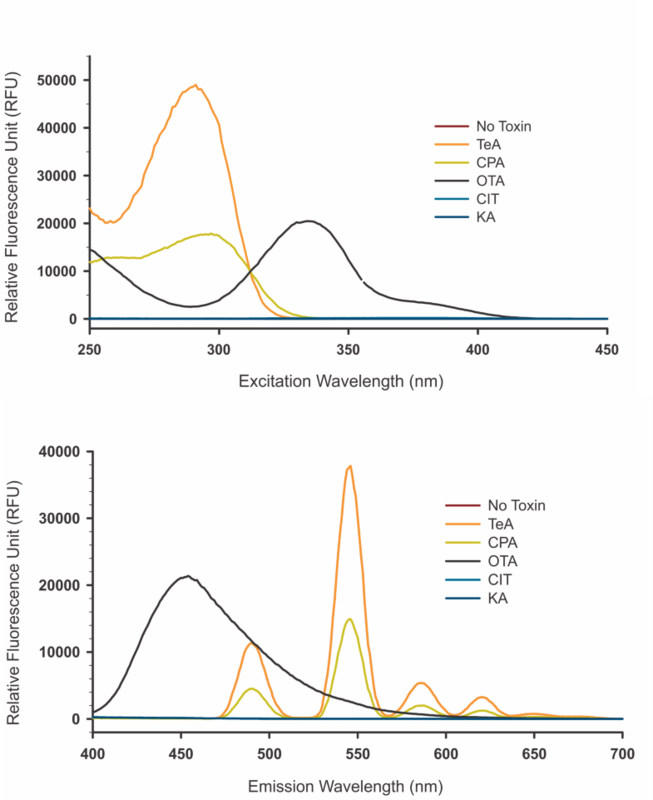 The effects of solvent type, water content, and pH on the TeA-Tb3+ system suggested that optimal conditions for luminescence were in 90% methanol with 10% aqueous buffer at pH 3. In competitive assays, the luminescence of the TeA-Tb3+ complex decreased as the concentration of competing metal cations increased. Among the cations tested, Cu2+ was the best inhibitor followed by Al3+, Au3+, Fe3+, Co2+, Mn2+, Mg2+, and Ca2+. Two cations, Na+ and K+, showed no significant inhibition. This is the first report to describe the coordination of the metal-chelating mycotoxin TeA with lanthanides and the ability of TeA to serve as an “antenna” for the efficient transfer of energy to the lanthanide with resulting luminescence. 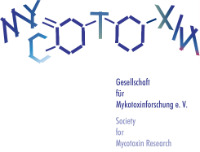 Understanding the ability of mycotoxins such as TeA to chelate metals provides insight into how they exert their toxic effects. The online version of this article ( https://doi.org/10.1007/s12550-019-00356-w) contains supplementary material, which is available to authorized users. This work was supported by USDA-ARS project number 5010-42000-0049-00D. This research was supported in part by an appointment to the Agricultural Research Service (ARS) Research Participation Program, administered by the Oak Ridge Institute for Science and Education (ORISE) through an interagency agreement between the US Department of Energy (DOE) and the USDA. ORISE is managed by ORAU under DOE contract number DE-SC0014664. The mention of trade names or commercial products in this publication is solely for the purpose of providing specific information and does not imply recommendation or endorsement by the US Department of Agriculture. The USDA is an equal opportunity provider and employer. All opinions expressed are the author’s and do not necessarily reflect the policies and views of USDA, ARS, DOE, or ORAU/ORISE.